Talladega, which is about 50 miles east of Birmingham, is the county seat of Talladega County. The city has more than 15,000 residents, which includes nearly 5,800 households and 3,700 families. The population density of the 24-square-mile city is 653.2 people per square mile. Talladega boasts several properties listed on the National Register of Historic Places, including J.L.M. Curry House and Swayne Hall. Most notably, however, the city is in close proximity to the Talladega Super Speedway, which hosts two NASCAR races annually. The speedway is the longest NASCAR oval at 2.66 miles. Also nearby is the International Motorsports Hall of Fame. Additionally, Talladega is home to the Alabama Institute for the Deaf and Blind and the oldest bank in the State of Alabama- The First National Bank of Talladega. In 2013, Alabama's transportation director recorded 357 car accidents in the City of Talladega. This includes five deaths and 159 injuries. In Talladega County, 1,681 car accidents occurred, resulting in 27 deaths and 597 injuries. This, unfortunately, showcases the fact that those Alabamians who live in or are traveling through Talladega and its surrounding areas are in no way immune to the possibility of a serious automobile accident. Please remember that if you or a loved one are in an automobile accident, your primary concern should be receiving medical attention. This is for your own safety as well as to ensure you have medical records on file. Your attorney cannot successfully fight for any compensation to which you may be entitled without documentation of your injuries. Were you to forgo receiving medical attention, the insurance company would use this against you, putting at risk any possible compensation you may be able to receive. As soon as you have tended to your medical needs, you should contact the Talladega car accident attorneys at Hollis, Wright, Clay & Vail, P.C. The skilled attorneys at Hollis, Wright, Clay & Vail, P.C. will invest heavily in your case, using significant resources- financial and otherwise- to determine a root cause of the accident. This may include the use of engineers who will assist in reconstructing your accident. We will also take into consideration if there are other factors involved in the accident, which may include texting and driving, drunk driving or distracted driving. Centrally located in Alabama and only 50 miles from Talladega, our attorneys regularly handle personal injury and car accident claims for residents from the Talladega area. Alabama State Law dictates that those injured in an automobile accidents on Alabama roadways receive compensation for injuries sustained, lost wages, medical bills, pain and suffering and emotional distress. 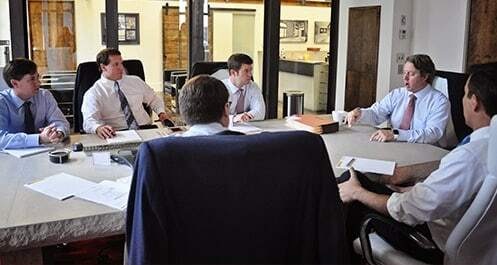 Our attorneys are well versed in Alabama law and will ensure you receive the compensation to which you are entitled. With a combined practice experience of more than 100 years, the attorneys at Hollis, Wright, Clay & Vail, P.C. are some of the most accomplished and experienced attorneys in the state as far as pursuing injury claims involving car accidents. They are set apart by their deep desire to acknowledge each client as an individual and not just a case. If you'd like to speak with one of our Talladega car accident attorneys, please contact us at 844-529-8255 or 205-324-3600.